A modern take on a classic heart bracelet. Crafted in sterling silver with sparkling cubic zirconia. 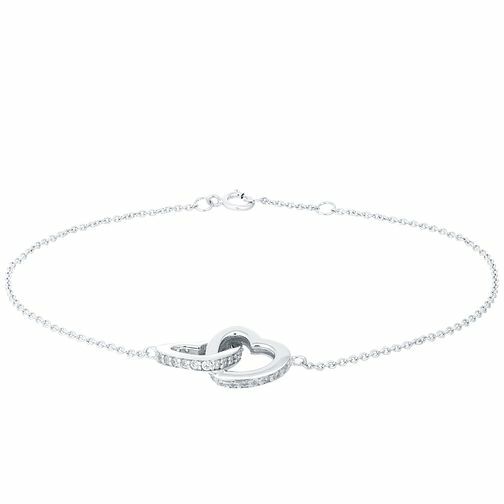 The interlocking hearts make a perfect symbol of everlasting love. Sterling Silver Cubic Zirconia Interwined Heart Bracelet is rated 3.5 out of 5 by 2. Rated 5 out of 5 by Anonymous from Beautiful dainty bracelet My partner purchased this bracelet for my first birthday as a mummy from my daughter and I absolutely love it. It’s so dainty and pretty. Had soo many compliments on it and even purchased one for my mum for Christmas. Rated 2 out of 5 by Anonymous from Very weak bracelet I am on my third version of this bracelet now as each one has broken at the link with the hearts. Even the slightest pressure on the links will cause this to break.